We normally cover software exclusively here on 1800Pocket/PC but every now and again something truly awesome catches our eye. For me, it was this Surface Phone mock-up found over on the Microsoft Tribe forum on The Verge. Simply put, the design, which was posted by user Mr. Mulderfox, is gorgeous, and while it might not all be technologically viable at the moment, it does give us a peak at some ideas that hopefully will make their way to the Redmond offices at some point in the future as Windows 10 Mobile adoption increases and devices evolve. The most notable feature of the Surface Phone concept is its ability to transform from smartphone to tablet instantaneously. 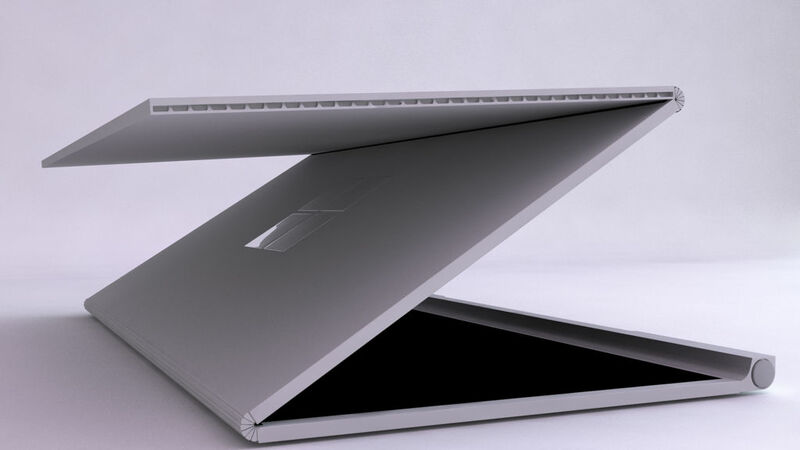 As you can see from the image posted below, the fold-up screen takes some design inspiration from the new Surface Book laptop and its revolutionary hinge. Those Microsoft logo or speaker on the front are just an on screen image to make sure you know where is the speaker on phone mode .It then will disappear on tablet mode. As with the Lumia 640 and Lumia 950, the Surface Phone would come in both a normal sized and XL version, though with the way the screen folds out, I fail to see the point in having two versions. The size of the normal sized phone is 145x75mm, while in tablet mode the screen size is 203x140mm. For the XL version, you’d see the size increase to 165x85mm in phone mode, while the tablet mode screen size is “almost the same as iPadAir” according to Mr. Mulderfox. The concept phone also features a 13MP camera, stylus, and could be in a mid-range design, though we’d probably see something from Microsoft more on the high-end if its other Surface products are any indication. Check out the entire post and all of the photos via the source link below. Tell us what you think of the design and feel free to share your own designs via our forums.